Michael and I have pursued our dream of turning our back yard into an edible landscape for several years. We’ve replaced inedible bushes with blueberries, raspberries, and grape vines, and planted apple, cherry, plum, peach, fig, and pecan trees. But there are two trees I wish we could grow in our yard and can’t due to the cold winters: avocado and Meyer lemon. Last year I saw Meyer lemon trees in containers at Home Depot and I briefly thought I might try to grow one indoors, then I thought of the lime and calamondin orange trees I had tried growing indoors, both of which failed, and I had to walk away. Those were only $20 experiments, the Meyer lemon tree would have been a $69 experiment, a bit more of an investment, so I need to study a little more before attempting it. 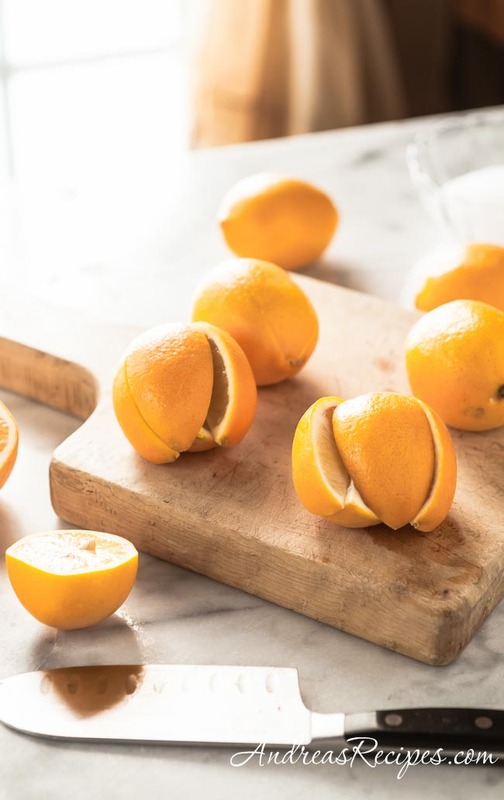 Meyer lemons are a cross between lemons and mandarins, and they have a different taste and appearance from the lemons we usually find in the grocery stores, the Eureka lemon. 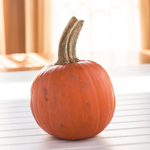 The flavor is milder and sweeter, and the color when ripe has a bit of orange in it. Last week Kristy Bernardo and I were doing a girls’ morning out run to Trader Joe’s, a monthly trip we do together, and we geeked out over the Meyer lemons, which we don’t see in the grocery stores very often around here. I brought home several bags and got to work slicing and salting, thinking about Moroccan tagines the whole time and wishing once again that I had a Meyer lemon tree growing in the house. If you’ve never had preserved lemons in Moroccan food, it’s something you have to try. The lemons are preserved in salt and lemon juice then stored in a jar for 30 days. It’s so easy, really. The hardest part is waiting. Once they’ve fully brined, then you can take out a whole lemon or remove just one slice as needed for a dish, rinse off the excess salt, and cook with it. If prepared and stored properly, the lemons will keep for up to six months. You’ll find many Moroccan tagine recipes, salads, and chicken dishes that call for preserved lemons, and the bit of salty, tart flavor it adds is exquisite. Adapted from Mediterranean Cooking, by Paula Wolfert. Sprinkle 1 tablespoon of sea salt in the bottom of the jar. Quarter 1 lemon, slicing down from the stem end down to the tip but not all the way through so the quarters stay attached to each other. The lemon will look like a claw. Coat the pulp with sea salt and press it down into the jar, squeezing out the juice. Sprinkle a little more salt on top. Repeat with as many lemons as will fit in the jar. Pour some fresh lemon juice on top to cover the lemons, leaving a little headspace in the jar, then seal it. 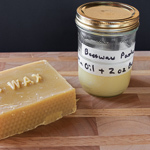 Keep the jar in a warm, dark place (pantry or cupboard) for 30 days. Turn the jar upside once a day to distribute the juice and salt, then sit it back on the shelf. When ready to use, remove a lemon or a slice and rinse it well. Make sure the lemons in the jar stay covered by the juice and salt, and they will keep for up to 6 months. 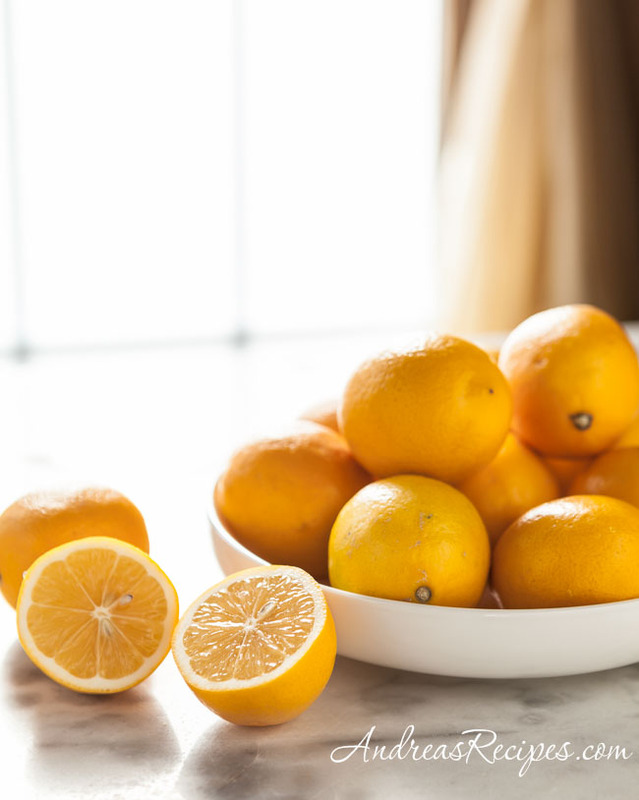 Meyer lemons are perfect for preserving, but you can use the standard grocery store lemons if necessary. You’ll probably fit about five lemons in the jar and then juice the others. Make sure you sterilize the canning jar and lid before using to help prevent the growth of unwanted bacteria. I am never without a jar of preserved lemons working in my fridge. Preserved lemons are a great substitute in recipes that call for capers, too. Thanks for linking to my tagine recipe! This is what I was going to do with my meyer lemons, too! That is, until I decided to mix mine with booze and drink them 😉 We did geek out over these, didn’t we? And I’m still excited about the frozen leeks you turned me on to. I think next month we should add that Asian market in Chantilly to our shopping trip – just imagine the fun we could have! My brother has a lemon tree in his yard and I’m jealous every time I visit him. 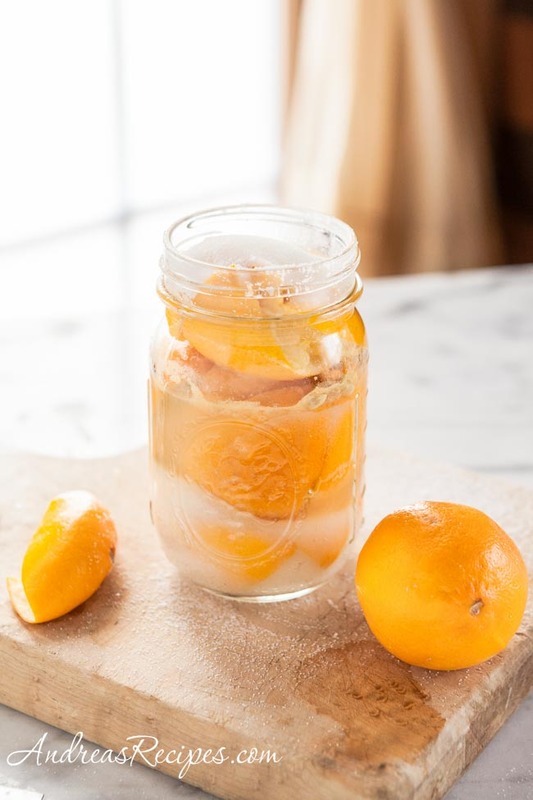 Preserved lemons are something I’ve never made and barely cooked with; need to try this! Hi Lydia. That’s a great idea to used preserved lemons for a caper substitute. Hi Kristy. Yes, we have to do the Asian market as well, I love that store! Hi Kalyn. I am always envious of the folks in California with Meyer lemon trees, I so wish I could have one in our yard. Oh, wow! I have got to try this. Never thought about keeping them in the fridge, like that. Does it work for regular lemons? I buy them in bulk and then sometimes they spoil. Hate that, when it happens. Thanks for sharing. Come visit when you can. The flavor of these must be great! They look so good! 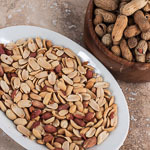 Do you have any recommended recipes to use them in? Question: what do these preserved lemons taste like? Are they overly salty? Hi SharleneT. Yes, you can make this with common grocery store lemons, too. The flavor will be a little stronger, but it will work fine. Hi L. For a start, try the Chicken Tagine, a stew, that I linked to at the end of the blog post at The Perfect Pantry blog. I’ll also post a recipe or two next month that will use these lemons as well. Hi AnnieB. Your tree sounds beautiful. By themselves, the lemons are salty and tart, just remember to rinse the excess salt away before cooking with them. Oh, man. Every time I see preserved lemons, I’m reminded that I have tried twice to make them, waiting and waiting…I’ve even tried Bittman’s quickie way which I wouldn’t recommend. I’ve failed each time wasting all those lovely lemons. Now that I have my own tree, I just may be tempted by this to try one. more. time. Thanks, Andrea! Lovely post. Oh man, I loved preserved lemons, especially Meyers! I’m planning on buying a Meyer lemon tree from the farmer’s market sometime this summer. I live in Nashville (hardiness zone 6-7) so hopefully it’ll do well. I’ve made both and have to admit that I love the regular lemons and am not fond of the Meyer lemons. I use them anywhere that I want a bit of lemon or any recipe that calls for lemon juice or zest. I cut the lemon into 8ths before preserving and then when I go to use them, they are nice and small and easy to get out of the jar. I only use the rind and rinse it very well to get most of the salt out. Other than putting the inside of the preserved lemon into the cavity of a chicken before grilling, is there anything else to do with the insides of the lemon? We have some rather large lemons here in Portugal and I’m seroiusly wondering if I’ll be able to get them into a jar whole. Can anyone tell me if it’s a real problem if I cut them through, instead of leaving intact at one end? Hi Anne. Yes, you can cut all the way through the lemons, making the claw is simply the traditional way of preserving. Kim, I’m so glad you tried it! I think you’ll really enjoy the flavor. And your tagine is beautiful, I’ve been wanting one.